Hard Evidence: is the UK heading towards mega-dairy farms? 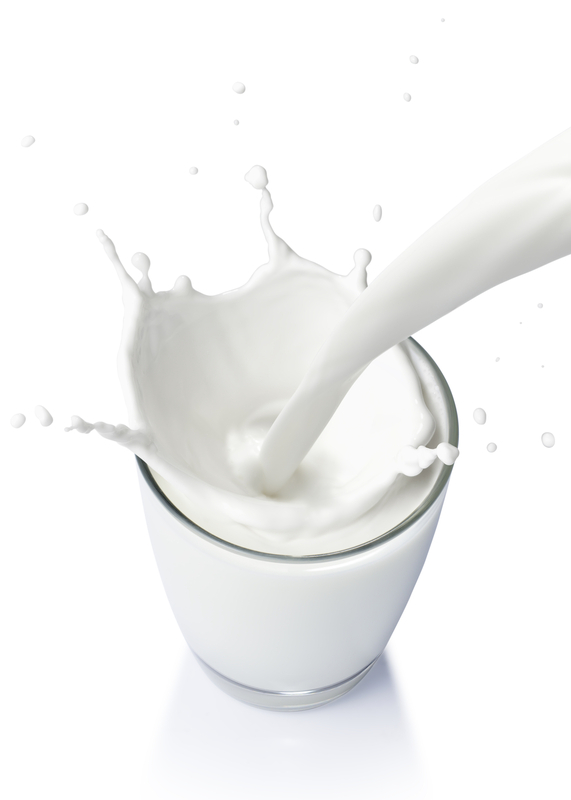 The dairy sector in the UK is going through a period of high uncertainty. Not only are suppliers having to cope with retail price wars and the fact that milk prices are being reduced by the increasing alignment of domestic and world dairy prices, they are also facing the fact that milk quotas will be eliminated in March, which promises to fully expose the sector to market forces. So it is not surprising that recent discussions have focused on how the dairy sector in the UK should adapt. Some view the future as inevitably going towards mega-dairy farms, imitating those existing in the US, where thousands of cows are milked under huge sheds without seeing the sun, in something that is closer to an intensive factory than a farm. Whether this comes to pass depends on whether these mega-dairy farms are the only solution to maintain the competitiveness of the sector and therefore its survival. In the UK there are just a handful of dairy farms with herds of over 1000 cows, whereas in the US they can be ten times that size. The prospect raises two questions: are farms whose practices resemble mega-dairies, including feeding cows in-house all year round, more profitable, and does this necessarily mean low animal welfare standards? First some context. The average price received by farmers in 2014 (up to October) was 32.17p/litre (though it can vary by over 10p/litre depending on the nature of a farmer’s supply contract). This is much about 6.7 times higher than the average milk price received in 1973, though in fact the price has fallen since then once you adjust for inflation. This doesn’t take into account the effect of the cost of production, however. If the cost of production has fallen faster than the wholesale price of milk, this might not be a problem. Unfortunately historic production costs are not available. But we do have historic feedstuff costs going back to 1988 from the department of agriculture, which are the highest component of costs (more than double labour, which is second). So these can give us some idea of what has been happening. 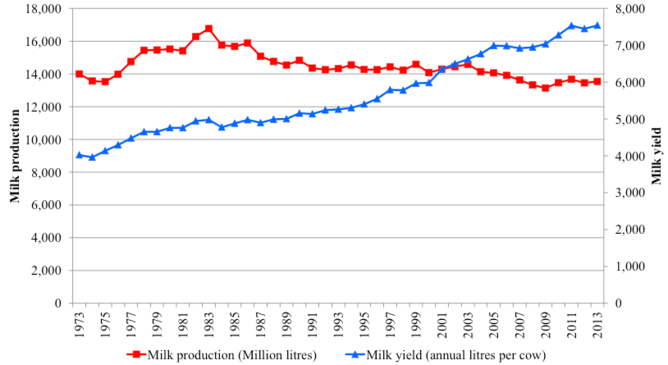 As can be seen from the chart that I have used these figures to plot below, this suggests that the true price of milk that farmers receive has fallen since 1995. The decrease in milk prices reflects how competitive the sector has become, partly because retailers drive down prices and partly because of increasing competition from other food products. The chart below shows the decline in purchases of milk products, driven by a strong decline in the consumption of full-fat milk that has not been replaced by skimmed milks (note that cheese consumption has been rising but not very strongly). Notice that the number of cows has been falling more slowly than the number of farms. This implies that the number of cows per farm has been growing, which might suggest that we are heading towards mega-farms. 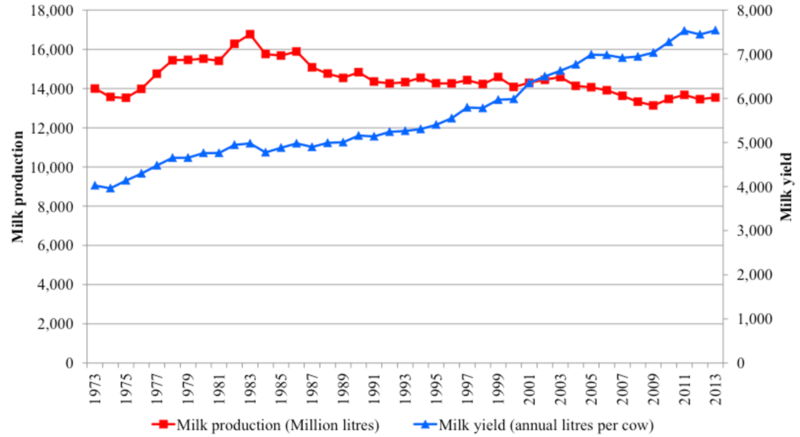 It is also worth pointing out that there has not been a corresponding drop in the volume of milk being produced. This is because yields per cow have been growing steadily thanks to a combination of technological advances and more high-yielding cows. A recent UK survey by Scotland’s Rural College found that of the country’s 863 dairy farms, the traditional British dairy management style of all-summer grazing and winter-only indoor feeding was practised by less than a third of respondents, and on average, herd sizes were larger within systems that feed indoors. This would mean that the proportion of cows being milked in such farms will be rather higher. This decline in grazing has happened in many countries. Reasons include difficulty in controlling feed rations for high-yielding animals, uncertainty of grass supply in some countries, practical difficulties such as walking distances and lying times, and the availability of a stable labour force. High-yielding cows can also demand up to five times as much energy, which can be difficult to achieve by a grazing and silage-based diet. This can mean that some additional feeding is required. 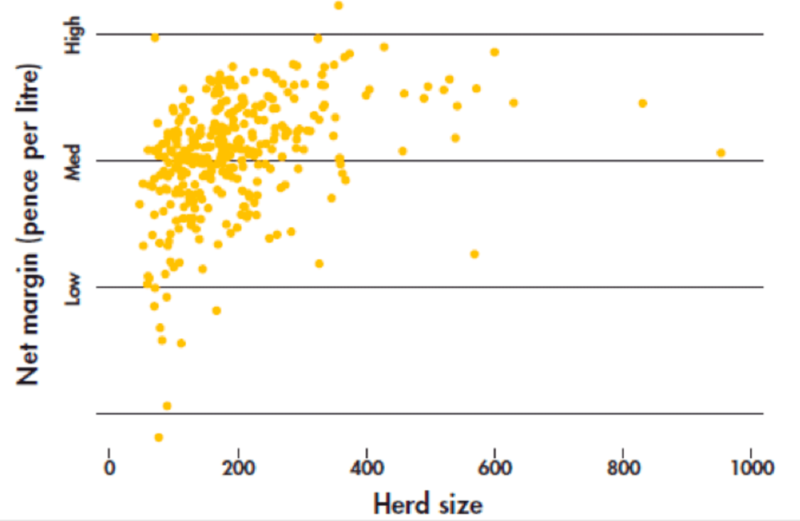 But while the above figures are based on profitability per litre of milk produced, a very important point is that most probably very small herds will not provide sufficient income for owners. This can make the size of the enterprise a key aspect, depending on the farmer’s objectives. Grazing-based systems have on average fewer cows than farms with indoor-based feeding systems. And certainly, housing and management style can affect the welfare of dairy cows. It has been reported that the British public is opposed to indoor dairy systems – though many will not be aware that traditional British systems have cows spending winters indoors anyway. The Farm Animal Welfare Council says that housed dairy cows in the UK can have an acceptable standard of welfare as long as suitable housing is provided together with skilled animal husbandry and veterinary practice. 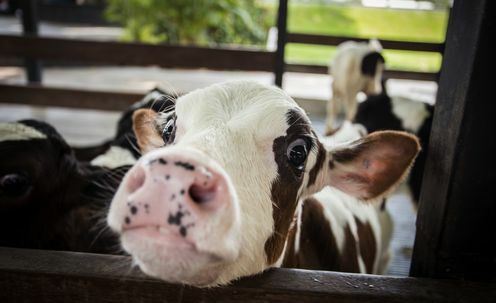 Nevertheless, continually housed dairy cows can be susceptible to a range of health issues in feet and legs and are at greater risk of health disorders such as mastitis and retained placenta. There are techniques that may lower the incidence of some health issues, however. And dairy cows maintained in grazing systems may also be at risk of health issues such as lameness and milk fever and are also exposed to prevailing weather conditions. There are still a variety of dairy management systems in use but there does certainly seem to be a clear trend towards farming that feeds more time indoors. If larger farms don’t necessarily mean more profitability – or lower welfare standards, thanks to our UK legislation – it may well be that farmers are making up for lower margins by seeking to generate more income from their holdings. A couple of positive closing thoughts: We always have the option of buying our dairy products from farmers that support higher welfare standards. And a shift towards larger indoor farms is unlikely to result in US-style mega-dairy farms – we simply don’t have the space. Bethan’s PhD is funded by the Scottish Government. Cesar Revoredo-Giha does not work for, consult to, own shares in or receive funding from any company or organisation that would benefit from this article, and has no relevant affiliations.